Ocular rosacea pterygium or ocular rosacea surfer’s eye is a variant of ocular rosacea which more commonly occurs in rosacea patients who are often outside or in the water surfing – swimming or in windy weather. Ocular rosacea pterygium is seen a growth or pinkish film that forms on the white of your eye usually on the inside corner closest to the nose. The symptoms of Ocular rosacea pterygium include dryness of the eye, a gritty or sandy sensation that ‘there is something in your eye’. This sensation can lead to rubbing of the eye, inflammation and additional irritation. The eyes may feel as if they are burning or itching. 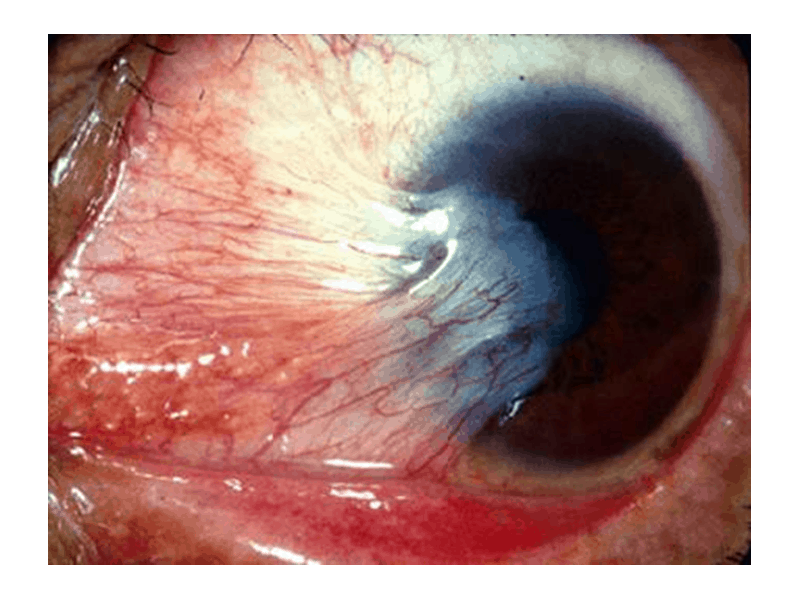 Left untreated pterygium, it can result in blurred or impaired vision. The causes or aggravating factors of Ocular rosacea pterygium include exposure to UV rays from the sun or ultraviolet light waves. Exposure to airborne irritants from pollution, dust, and wind which can result in dryness of the eye and inflammation can cause or worsen the symptoms of Ocular rosacea pterygium. Dehydration is a major component primary cause of Ocular rosacea pterygium. When the eye lacks adequate moisture, it becomes more susceptible to irritation and inflammation. Our eyes are constructed of 96% fluid or which is primarily water. Whenever the body is dehydrated, the eyes which are primarily composed of bodily fluids will be the first to be affected. This is the primary cause of the dry, red or burning sensations. Spending many hours outdoors in the wind, heat or cold temperatures will result in a loss of moisture from the eyes. Rosacea-Ltd is ideally formulated to address the symptoms of redness, irritation and inflammation associated with Ocular rosacea pterygium. Simply cleanse the outer areas of skin around the eye, and rinse with splashes cool water. While the skin is damp, either glide the tan Rosacea-ltd disk one time to the skin over an under the closed eye or rub the disk over your dampened fingertips and gently apply to the skin around the closed eye. The minerals in Rosacea-Ltd are synergistically combined to soothe the eye and aid in healing of the damaged eye tissue as the minerals migrate and are absorbed into the skin.